As of June 24, some of the most powerful astrology of the mid-1960s has begun to come of age. On this date, the planets Uranus and Pluto have moved into a difficult 90° angle called a square. This angle typically brings challenges that force change in areas represented by the planets and signs involved. In the case of Uranus and Pluto, we are being pushed to upgrade or even revolutionize our identity (Aries) to enable greater freedom, awakening, and genius (Uranus) and to transform all structures and large organizations (Capricorn) to bring truth to light and permit spiritual evolution (Pluto). This cycle began in 1965, when Uranus and Pluto came together in Virgo (see diagram at left). On October 9, 1965, they reached the same degree in Virgo, creating a relationship called a conjunction; they formed two more exact conjunctions in April and June 1966. In astrology, a conjunction joins or merges the energies of the planets involved and expresses them in areas represented by those planets and the sign they occupy. In this case, Uranus’s electric, erratic nature and energy of sudden change, revolution, awakening, and genius combined with Pluto’s deep, transformative nature and energy of destruction, evolution, surrender, and hidden power. Together, they created explosive energy that demanded change, and they ushered in a new historical cycle. In the decades since, the seeds Uranus and Pluto sowed at their conjunction have had opportunities to sprout and take root, and some have created tremendous change. Because Uranus and Pluto occupied Virgo at the time of their three conjunctions, many of the changes we have seen since the mid-1960s have involved Virgo themes: health, purity, independence, pets, service, jobs, daily routine, practicality, food, and the connections among mind, body, and spirit. In addition, because Virgo is a mutable sign, it comes at the end of a season and represents energy concerned with clearing out the old to make way for the new (as opposed to cardinal energy, which begins a season and creates the new by initiating new efforts, or fixed energy, which comes at the middle of a season and maintains what once was new by putting order, systems, and routines in place). Virgo energy analyzes and then takes practical steps to improve daily life in order to serve the greater good. In the mid-1960s, Uranus and Pluto in Virgo helped adjust or eliminate old ways (discrimination, pollution, colonialism) to permit independence and protect health. Virgo’s ultimate goal is perfection: for example, during his presidency Lyndon Johnson (a Virgo) sought to improve America and create a “Great Society” that would eliminate poverty, hunger, and illness. As of June 24, the Uranus-Pluto combination has reached a turning point. These planets’ movements through the zodiac since the 1960s have brought them into the first of seven exact squares (see diagram at right) that will occur through 2015. Astrologically, a square consists of two planets in a 90° angle, a relationship that tends to bring clashes and turmoil (especially on the inner plane) in order to raise awareness and motivate us to make difficult yet beneficial changes. These two planets represent the major astrological factor making 2012 a pivotal year in history and human evolution. Their current square angle indicates a time of significant change is at hand, and their combination offers an opportunity to renew the idealism and urge toward improvement and better health (not just physical health, but emotional, mental, and spiritual wellness) that these two planets seeded nearly five decades ago. Unlike the mid-1960s, when Uranus and Pluto occupied mutable Virgo, today these planets occupy powerful cardinal signs that demand the new instead of fixing the old. Uranus in Aries expresses its electric, exciting energy in pioneering, independent ways. At its best, it uses Uranus’s trademark computers and other technology to benefit not only humanity as a whole (Uranus) but the individual (Aries) and the need to blaze new trails (Aries). Uranian insistence on freedom can help us awaken to our true, spiritual identity (Aries) and our unique genius (Uranus). Meanwhile, Pluto in Capricorn is bringing deep change (Pluto) to large structures (Capricorn). Those that do not adapt may fall: already, we have seen major corporations disappear in the wake of Pluto’s transformative energy. At its best, Pluto in Capricorn expresses Plutonian power and hidden energy not only to expose truth and find unrecognized riches in dark or unexplored places but to reinvent all structures and re-create all hierarchies (Capricorn) to enable greater evolution (Pluto). What Does Our “Report Card” Say? This first Uranus-Pluto square comes while Pluto is retrograde, indicating an outer-inner, push-pull quality. Uranus in Aries wants to rush forward (Aries) to create quick change (Aries) on the material plane, but Pluto retrograde is pulling our evolutionary quest (Pluto) inward (retrograde). This situation suggests we go deeply within (Pluto retrograde) to evaluate all structures and boundaries (Capricorn) and use what we learn to inform our efforts to free (Uranus) our personal (Aries) and collective (Uranus) identity (Aries). 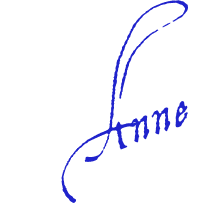 During this process, we can gain vital information by looking to the past. Regardless of whether you were born before or after the Uranus-Pluto conjunctions of 1965 and 1966, take some time to explore how much the world has changed since that time. On a simple level, consider how American culture has evolved (Pluto) beyond casual, rampant littering to widespread acceptance of recycling (Virgo) . Note the much greater role pets (Virgo) play in daily life (Virgo) and how awakening (Uranus) to the importance of cleaning up after one’s dog has contributed to health and cleanliness (Virgo). On a more complex level, consider how concerns about health have exploded into today’s huge medical system and how desires for holistic solutions have created an industry of alternatives (often not covered by insurance). How else has the world changed since the mid-1960s? In light of the past, how are we doing in the present? Does today’s world live up to the promise and idealism seeded in the mid-1960s? What do you believe needs to change to create a harmonious, healthy, ideal culture? If you had to issue a report card, what grade would you give the various structures in your life? How would you grade humanity as a whole? And most important, how would you grade yourself? Using the results of your reflections, consider what changes you will make to improve your personal grade. How can you empower (Pluto) yourself to create necessary changes? What structures in your life (your body, home, routine, community, belief system) support your ability to be your best self, and which need adjusting? Who are you, really? Can you be brave enough (Aries) to start expressing your unique (Uranus) identity (Aries)? As you change, you help bring change to the world around you. By tapping your courage and daring to be your true self, you inspire others to look within, reckon with who they really are, and begin expressing their own truth. By making healthful choices and refusing what does not uplift your life, you empower others to do the same. By integrating your mind, body, and spirit, you bring spiritual power to all you think and do, and you help others do the same. 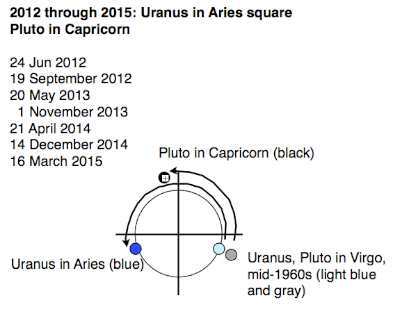 As the diagram here indicates, the Uranus-Pluto squares will continue through early 2015. Throughout this period, one of these two planets will be retrograde each time (except for the final square in 2015), indicating we have much to accomplish on the inner, personal plane in order to be ready for the new and better world we must create at this moment in history. If you begin your personal Uranus-Pluto changes now, you will be in a good position to assist in the birth of the new. Whatever challenges you face, remember that the world needs you—the best you that is possible. Greeetings ; living in Harmony -Author of this article. I was born in 1966, during the Pluto and Uranus conjunction. I believe this conjuction unleashed a very powerful enrgy for Freedom and Spiritual evolution, finding our truth, to say the least, 1966 is when the Hippie movement began to take place and as we all know this movement was all about Freedom from Opression and dogma, exploring alternative drugs to break out of the seriousness of the times. Everything was an experiment in that time from the music to the movies, to political change. all those babies being born between 1965 – 170. were inprinted with this concentrated life force. Those of my generation are in our mid 40’s, and boy have we made a difference, along with many others who have changed in order to find truth. a big pat on the back… we must congratulate ourselves for being the catalyst inbued with these gifts. After reading this article I see myself in a new light, not one of pity or self deprication, but one of exaltation for a work well done. We are reaching the pinacle of our journey. Rise high oh bretheren and sisterhood of the Phinex order, and take flight, for our time has come of age. Thanks again to the wise that used the heart and wisdom to write the words in this article.